Turkey’s Blockade of Russian Naval Vessels’ Access to the Mediterranean, Russia’s Black Sea Fleet Completely Cut Off 5.1428571428571 out of 5 based on 7 ratings. 7 user reviews. In times of war, the passage of warships shall be left entirely to the discretion of the Turkish government, according to the document. From a legal perspective, Turkey has no legal grounds to create obstacles for Russian vessels carrying cargo, including military cargo, Russian lawyer Vladimir Morkovkin told RBK. Turkey can ban non-friendly vessels from navigating through the Straits only if at war, the expert explained. After World War II, Ankara made several efforts to gradually strengthen its control over the Straits. In 1982, Turkey tried to unilaterally expand the regime of the Istanbul port over the entire area of the Straits. The decision was harshly criticized by neighboring countries, and Turkey stepped back. 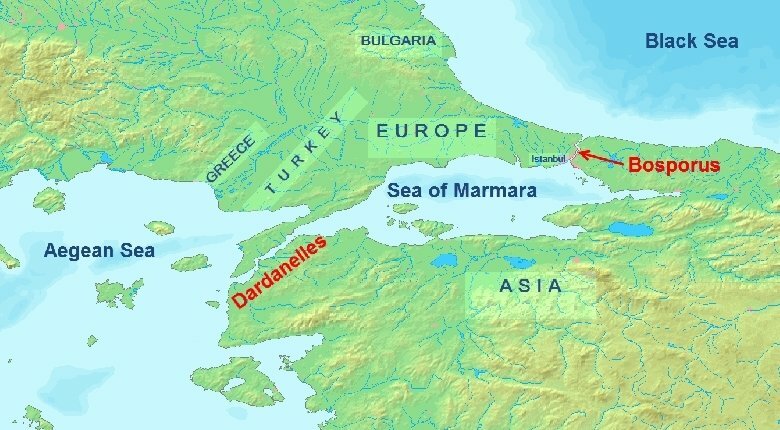 Turkey has begun a de facto blockade of Russian naval vessels, preventing transit through the Dardanelles and the Strait of Bosporus, between the Black Sea and Mediterranean. It is a 1936 agreement that gives Turkey control over the Bosporus Straits and the Dardanelles and regulates the transit of naval warships. The Convention gives Turkey full control over the Straits and guarantees the free passage of civilian vessels in peacetime. It restricts the passage of naval ships not belonging to Black Sea states. The terms of the convention have been the source of controversy over the years, most notably concerning the Soviet Union‘s military access to the Mediterranean Sea. Turkey has now invoked its power, but has not publicly stated whether they are blocking Russian Naval Vessels because Turkey is “threatened with aggression” or whether Turkey considers itself to be “at war.” Last week, Turkey shot down a Russian military jet over Syria and this has caused a major rift between the two nations. It is important to remember these facts because, as a NATO member, Turkey can invoke Article 5 of the NATO Treaty which requires all NATO members to come to its defense if Turkey is “attacked.” So if Russia decides to fight back against Turkey downing its military jet, the Turks might call NATO and claim they’ve been “attacked” thereby calling-up NATO forces to go to war against Russia. TURKEY and nato are playing with fire and if they don’t come to their senses and start using their brain cells if they really have any , the big bear will not hold back any punches , but the big bear is nasty to start first first he will use his intellect and then if push come to shove the zion’s and their armageddon soothsayers better be ready for the bears claws and fangs..